Originally known by the full brand name of Florence and Fred, but now more commonly known as F&F, this brand house was bought by Tesco to produce their on-trend extensive clothing range. They use top designers to produce a full clothing range for the whole family, but don't be fooled into thinking that the affordable clothing you buy alongside your baked beans is anything less than top-notch. With their eye on Milan and Paris, the seasonal ranges feature anything from grunge to Chanel inspired tartans. The clothing is well made and inexpensive but never cheap. Marketed for the average homeowner, this brand is chic and iconic with value for money at the heart of brand. Add F&F to your Favourites list and be the first to know every time they have a Sale on! 1st January 2018 - F&F New Years Day sales for 2018. 7th May 2018 - F&F Early May Bank Holiday sales for 2018, add to your diary now! July 2018 - F&F Summer 2018 sales, joining us? 23rd November 2018 - F&F Black Friday sales in 2018 start on Friday 24th November. Add products from F&F to your Love Sales list. Get the Love Sales button now! F&F July 50% off Sale is on across men, womens and childrens clothing! Shop for the whole family today! F&F June 50% off Sale is on across men, womens and childrens clothing! Shop for the whole family today! 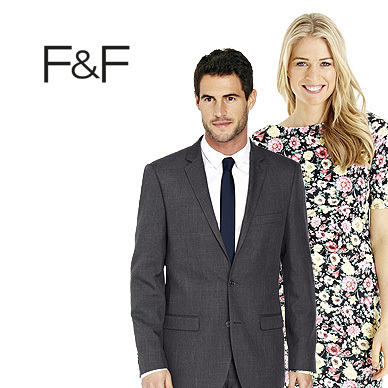 F&F Clothing Sale 20% off is now on across tailoring & suits! F&F Clothing Sale 20% off is now on across shoes and bags! Find the pair and shop the styles today!